Potted hydrangeas are often given as gifts, especially for Easter or Mother's Day. These beautiful flowering shrubs are prolific bloomers when planted outside, but when cultivated as gift plants, they are not nearly as hardy. Potted hydrangeas can be planted outside in warmer climates, but special care is needed if they are to survive and flower. Water your potted hydrangea often. The soil should be kept moist and not be allowed to dry out. Insert the tip of your finger into the soil to check the level of moisture at least once a day. If you have to be away from the plant for more than a day or two, slip a plastic bag over it so that the water will condense and drip back down onto the plant rather than evaporate into the air. Do not let the bottom of the pot constantly sit in a tray of water, however, as this can lead to root rot. If the potted hydrangea wilts badly, submerge the pot in water until it it thoroughly soaked, then drain the excess water out of the pot. Position the potted hydrangea so that it receives bright light. A windowsill is ideal, but if the window gets very hot, direct sunlight, the plant's leaves may become scorched. 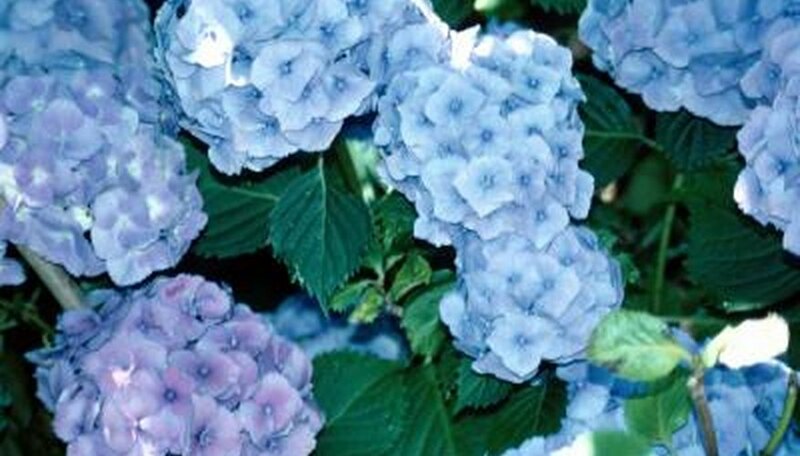 If that occurs, set the hydrangea back from the window or move it to a location that will receive indirect sunlight, such as a north-facing window. Move the potted hydrangea to a cooler location at night. A variance in temperature is necessary for the plant to bloom. Ideally, the plant should be exposed to temperatures averaging 55 degrees Fahrenheit each night, and in the mid 60s to low 70s during the day. Help your potted hydrangea re-bloom indoors or out by taking some steps to help it along. If you live in a warm climate, you can plant it outdoors. Wait until after the blooms fade, then plant it in a sheltered location in your garden well after the danger of frost has passed. In early July, prune it down to only 3 or 4 inches from the ground. In the fall, the plant will produce dormant buds. Bury the plant in peat moss or bark, and cover with burlap before the first fall frost. This may help the buds survive until spring. Remove the burlap and bark or peat moss in the spring when warmer weather arrives. If you live in a cooler climate, treat your potted hydrangea primarily as a house plant. To get it to re-bloom, wait until the flowers fade, then prune it back so that only two leaves remain on each shoot. Then re-pot the plant in a mixture of soil and peat moss, and set in a sunny location. In May or June, take it outside and bury the pot in the ground in a location that gets morning sun and afternoon shade. Fertilize it twice a week with a balanced (10-10-10) liquid fertilizer. Pinch back shoots to encourage large blooms. In the fall, bring it back inside before the first frost.